Do you know what a "puddler" is? I didn't. I had to go look it up, but here's what I found: It's a term related to a specific step in metallurgy, specifically in the forging of high quality iron. Puddling takes "pig iron" or "crude iron" and melts it down, removing impurities and adding minerals to create wrought iron, which can then be used to, you know, build things or make tools. I bring this up because we've officially been given our first clue about the murder mystery at the heart of HEROES IN CRISIS here in issue #2, and it actually tells us a whole heck of a lot about what is and isn't going on. Which means it's time to indulge in my favorite column tradition—wild speculation and theorizing! 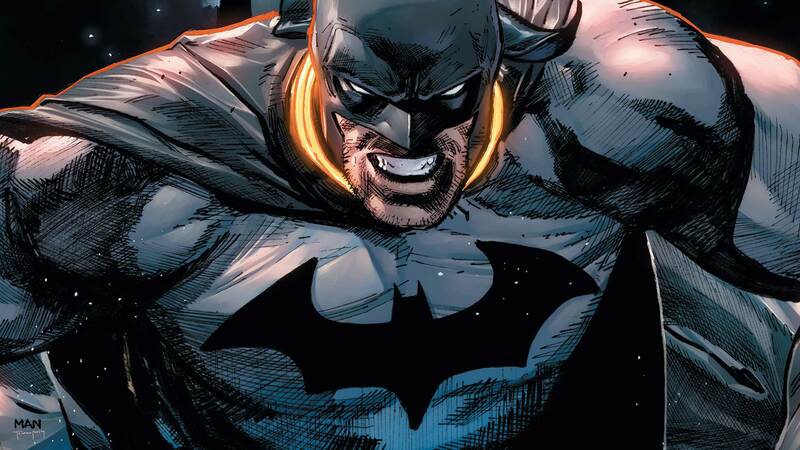 Obviously, Heroes in Crisis spoilers abound from here on out, so please be careful if you're not caught up this week. If you are caught up, it's time to try and solve a puzzle. We're actually going to work backwards for this issue, since the "puddlers" bombshell got dropped on the second to last page. Lois's tipster has written a note, signed with their pseudonym, warning that "our heroes hide themselves from us," and that "more truths are coming." Now, the truths here are obviously big ones. Superman's secret identity is on the line. Batman's too. Sensitive information flowed in and out of Sanctuary, supposedly being deleted immediately to prevent exactly this sort of event from happening. It's implied that the Sanctuary confessionals are what is being leaked, but really it could be anything—records, files, data of all sorts. There is a ton on the line. The person, or people, responsible for the tip are calling themselves "the puddlers." The fact that it’s plural implies that it's actually a group of people at work rather than just one murderer. There's likely a ringleader or someone at least running point on the conspiracy, though, and whoever that is had to have been close enough to know what Sanctuary was, smart enough to know how to outsmart systems designed by Batman, and ruthless enough to slaughter everyone there. Neither Harley nor Booster really fit all three of those descriptions, but let’s be real, do any of us truly believe that either of them did it? It all seems like a very deliberate frame up…or, at least, part of one. There are two distinct possibilities about our befuddled survivors. One, that they both got out of the massacre alive because whoever actually did it knew they would be good potential scapegoats; or two, they survived by mistake and dumb luck and weren't part of the plan in the first place. Or maybe it’s a combination of both. The chattering teeth found in Commander Steel's throat seem to suggest that it was a deliberate frame, at least toward Harley, but Booster may have still just been an accidental misstep. He's pretty good at stumbling into and out of really bad situations, mostly by mistake. But that raises another interesting point. We learned this week that Harley wasn't even supposed to be in Sanctuary in the first place. She followed Ivy there. So, whoever is trying to frame her (if they're trying to frame her) had to know that. That's a pretty big ask, and one that narrows down the list of potential suspects pretty drastically. This wasn't just random violence, it was tactical. What's more, there's the intent behind the whole thing. The codename "puddlers" carries a pretty strong connotation relating to the act of weeding out impurity, of making the whole stronger by culling the weak. Whoever set this whole thing up, at least as far as I can see now, seems to have been doing it because they believed the heroes using Sanctuary were somehow weaker for it. That narrows down the list of suspects even more. The DC Universe is full of megalomaniacs and super villains, but searching for strength and perfection—even when it means committing mass murder—isn't the MO of many. There are a few I can think of off the top of my head: Eobard Thawne, Professor Pyg, a whole laundry list of corrupt science-types like T.O. Morrow or Professor Ivo, but none of them really fit the bill for me to look too hard at them. Then, of course, there's the other possibility—that a villain might be the wrong direction entirely. I don't want to toss accusations around too soon, but we've seen already that Batman is more than willing to lie, even now, in the middle of all this, right to Superman's face. Bruce was using Sanctuary just like everyone else, but...well, I'm not entirely sure we should trust him yet, especially when he talks about Sanctuary's security protocols deleting everything instantly. Do I think Batman murdered a bunch of people in cold blood? Of course not. But, maybe someone close to him—or close enough to him—got their hands on something he was trying to keep hidden from everyone else. ...Of course, there's a very real chance we just don't have all the pieces on the board just yet. So, you know, probably best we all just keep reading. Heroes in Crisis continues with issue #3 (of 9!) next month. Let’s talk again then. HEROES IN CRISIS #2 by Tom King, Clay Mann, Travis Moore, Tomeu Morey and Arif Prianto is now available in print and as a digital download.